The conservative movement has no illusions about what happened over the last two weeks: they lost. That, however, doesn't mean they plan to ease up on their opposition to President Obama's agenda. After keeping the government shut down for 16 days, Republican leaders on Wednesday relented and agreed to pass a bill to reopen the government through Jan. 15 and extend the debt limit until Feb. 7.
Who is the conservative strategist behind the shutdown? Led by Sen. Ted Cruz, R-Texas, Republicans initially wanted to use the threat of shutting down the government as leverage in their efforts to defund Obamacare. After the government actually shut down on Oct. 1, the GOP's end game became increasingly unclear. Ultimately, Congress didn't come anywhere close to defunding or dismantling Obamacare. In fact, the only Obamacare-related condition in the deal is for stronger enforcement of the health care law -- the Health and Human Services Department is expected to produce a report assuring lawmakers they can verify incomes of individuals applying for subsidies to help pay for their insurance. "Unfortunately, once again it appears the Washington establishment is refusing to listen to the American people," Cruz said after the deal was announced. "The deal that has been cut provides no relief to the millions of Americans who are hurting because of Obamacare." Cruz commended the House of Representatives for its obstinance over the last two weeks and blasted the Senate for supporting the "status quo." "This is unfortunate, but nobody should be surprised that the Washington establishment is pushing back," he said. "Nobody should be surprised at the resistance to change. This fight, this debate will continue until collectively the American people can make D.C. listen." If the point was to get Washington -- or the public -- to listen to conservative concerns about Obamacare, Cruz's plan may have backfired. Not only did Cruz completely fail at delaying or dismantling the law, but the shutdown stole the spotlight from the hugelybotched rollout of the Obamacare website this month. The Republican Party, meanwhile, has taken a brutal hit in public opinion polls. The tea party movement has also taken a hit, according to a new Pew Research Center poll, conducted Oct. 9-13. The survey, with a 2.9 percent margin of error, shows that 49 percent of Americans have an unfavorable opinion of the tea party, leaving it less popular than ever. Cruz, however, has seen his popularity soar among conservatives. Since July, his favorability rating among tea party Republicans has risen 27 points, according to the Pew poll. "I am impressed with the effort led by the grassroots and Sens. 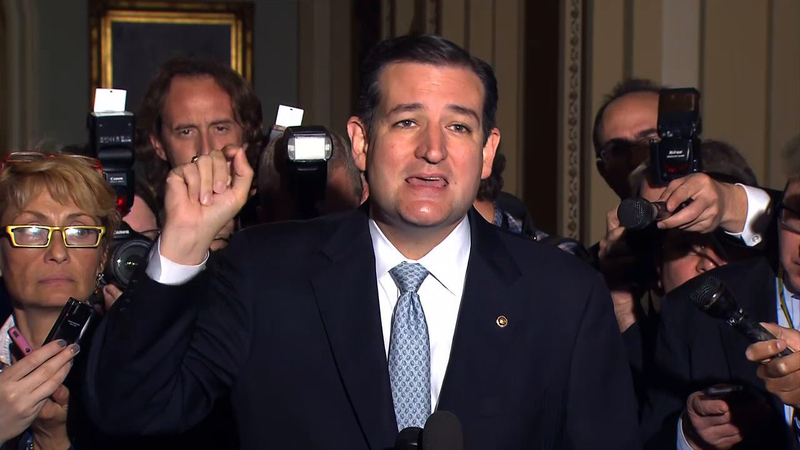 Cruz and [Mike] Lee," Jenny Beth Martin, National Coordinator of Tea Party Patriots, told CBSNews.com. "And the people across this country have done what the elite in Washington fear the absolute most -- they exercised their constitutional right and have demanded change." Martin conceded that the change they demanded didn't come about. She didn't, however, fault Cruz's strategy. "At some point you had to make the fight a meaningful fight -- it had to have leverage, and the continuing resolution was the leverage that was necessary to engage in this and to defund the law," she said. House Speaker John Boehner, R-Ohio, has managed to survive the shutdown fairly unscathed. The Pew poll shows that negative impressions of Boehner have only risen slightly since July, while Republicans are now 12 points more likely to call him the party's leader. "We fought the good fight, we just didn't win," Boehner told WLW Radio in Cincinnati. Senate Minority Leader Mitch McConnell, R-Ky., didn't seem too bruised from the shutdown fight in the Pew poll, but his deal to end the shutdown with Senate Majority Leader Harry Reid, D-Nev., may cost him in his upcoming primary battle. McConnell's tea party challenger Matt Bevin released a statement Wednesday saying, "When the stakes are highest, Mitch McConnell can always be counted on to sell out conservatives." Other conservative candidates, meanwhile, are taking their cue from Cruz in the wake of the shutdown. Kansas Senate candidate Milton Wolf on Wednesday released a press release pointing to an article calling Wolf "the next Ted Cruz."